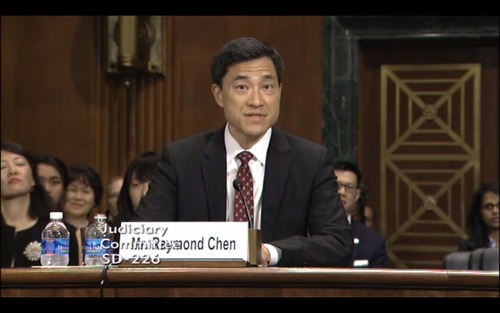 The Senate Judiciary Committee quietly conducted the confirmation hearing for Raymond Chen last Wednesday. While only three senators on the committee were present for the hearing, the questioning was refreshingly more patent-centric than in recent hearings for Federal Circuit nominees. The video of the April 24th hearing is available at this page: [Link]. You can view the introduction of Mr. Chen at the 23:20 minute mark. Mr. Chen makes his own introductions at the 29:25 minute mark. There was an impressive turnout of supporters. The questioning by the senators can be viewed at approximately the 38:00-41:16 (Hirono), 41:16-49:48 (Grassley), and 58:40-1:01:59 (Lee) minute segments. One might wonder if Senator Hirono has drunk the Kool-Aid of the anti-software-patent lobby, based on some of her questioning. She strikes me, however, as much more astute than that. The Federal Circuit recently affirmed the PTO in the appeal of In re Karl Urquhart by way of a Rule 36 Judgment. The oral argument is of interest in that it addresses broadest reasonable interpretation (BRI) of claim language as well as functional language. The claim was deemed anticipated by a patent directed at a bathtub that mixed hot and cold water, US Patent 1522120. Claim 13 requires the claimed system to have “a semiconductor process tool including a tank, wherein the semiconductor tool is configured to process a semiconductor component.” Even if you disregard the “configured to” portion, the claim still requires “a semiconductor process tool including a tank.” The Examiners insist that a bathtub is a semiconductor process tool. A bathtub is not even remotely related to a semiconductor process tool. The absurdity of this claim construction argument is matched only by the Examiner’s stubborn refusal to acknowledge that it is absurd. Unfortunately, this sort of thing has become all too commonplace within the USPTO. MPEP §2111; In re Suitco Surface, Inc. (Fed. Cir. Case No. 2009-1418, decided April 14, 2010)(“The PTO’s construction here, though certainly broad, is unreasonably broad. The broadest-construction rubric coupled with the term ‘comprising’ does not give the PTO unfettered license to interpret claims to embrace anything remotely related to the claimed invention.”). You can view the Rule 36 Judgment [here] that affirmed the rejection of the claims. The Supreme Court has released the audio of the oral argument in Association for Molecular Pathology v. Myriad Genetics, Inc. The Federal Circuit illustrated its flexibility last month by conducting an oral argument with one of the parties participating by telephone. It appeared to be a rare circumstance. The oral argument was scheduled for March 7th and a snowstorm along the East Coast caused many flights to be canceled. So, in this particular circumstance the appellant was allowed to argue by telephone. The USPTO appeared in court as the appellee. You can review the Rule 36 Judgment here: [Link]. You are currently browsing the 717 Madison Place blog archives for April, 2013.